The idea of Arsene Wenger having Twitter would have been an interesting one. Maybe, just maybe, the former manager set up an anonymous account to keep tabs on what people were saying, or maybe to troll some of his most ardent supporters and/or critics, but I suspect the chance of that are as slim as Grant Holt is not slim. 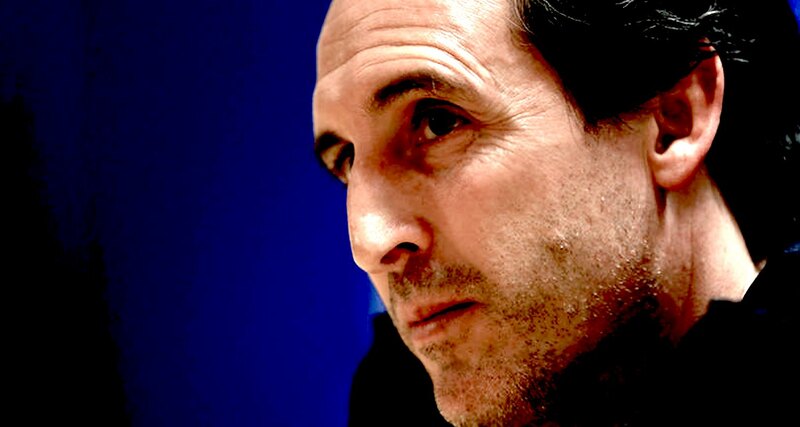 Unai Emery has one though and I had to scroll quite far down his mentions to find someone being rude. I say quite far, it was 10 hours ago, but there have been a lot of @s in the last little while because his last Tweet was to launch his brand new website. Emeryblog. ArseEmery. Emery2Mouse. Gingers4Emery. EmeryHolic. The Emery from East Lower. Nah. It’s just Unai-Emery.com because someone has previously bought unaiemery.com and is trying to sell it for $1995. They’ve even very kindly put together a finance package which would let you pay in installments but the Arsenal boss isn’t being held for ransom by some random web grifter, which augurs well for when we move into the transfer market again. “Stan is gonna love you, Unai!”, Raul might say. 1 – Amaze the opposition with your approach to the game. Taking the initiative can be key to the outcome of the match. 2 – Be clear about what you want. The players can’t have any doubts as to how we want to play, they can’t go out onto the pitch with uncertainty in their minds. To be fair, more than one player has come out and spoken about how meticulous the preparation is and how they’ve been told exactly where to stand and when. 3 – Create a positive mental attitude. A positive attitude is crucial for the team and their ability to carry out the game plan. 4 – Don’t take your eye off the ball. You have to foresee all potential problems both in the dressing room and on the pitch. GRANIIIIIT! But he’s got plenty to consider with his striking conundrum, his central defensive conundrum, and the rest. 5 – Evaluate before acting. Apply consequential thinking and take the right decisions at the right time. I’ve never heard the phrase ‘consequential thinking’ before, but I assume it’s just considering what are the potential outcomes to any decision or action you take. Like, if I take off my highest paid player in a game we’re trying to win, is he going to throw a little bit of a strop when he leaves the pitch? He has, oh well, should played better then mate. That kind of thing I guess. Also, there’s a section called ‘My Story’ which I assumed would be just about his journey as player and manager, but between the ‘The French challenge’ and ‘Arrival at Arsenal’, there’s a bit titled ‘A lover of Basque cuisine’. Apparently he owns a restaurant in Valencia and is opening one in Madrid too, and I have to say I’m also a fan of Basque cuisine so this gets a thumbs up from me. Anyway, it’s just kind of interesting to see a football manager quite so openly discuss the various facets of their life and work, even if they’re a bit ‘Inspirational quotes from a calendar’. Maybe some others do it and because it was something the previous boss would never have done it seems a bit left-field. Nevertheless, a technologically savvy Arsenal manager is a curious thing, and there even appears to be a blog section. Just for those running it, everyone’s got a blog these days and don’t even think about starting a podcast – EmeryCast or whatever – the market’s already crowded enough. Meanwhile, the injury to Danny Welbeck might just see us dip into the January transfer market. The injury to the England man has left a bit of a gap in the squad, and although we do have Eddie Nektiah coming through who can play as a striker, Welbeck’s versatility and ability to play anywhere in the front three means Emery’s options have been limited a bit. That is absolutely something unplanned. Yes, that makes you consider things. I am not saying that’s a green light to go to the market but we have good players in the house also that may get further opportunities like Eddie Nketiah for example. We need to see. We are in November so it’s a good time to start analysing what options we have in the market. We are not closing the door but it’s still not the preferred one. It may not be the preferred one, but 11 games in the next five and a half weeks are really going to push the limits of this squad, and it might well be a case that although we’d prefer to wait until summer we have to act in January to keep our ambitions for this season on track. One player we’ve been linked strongly with is Lille winger Nicolas Pepe. He’s tearing it up in Ligue 1 this season with 8 goals and 7 assists, and that’s off the back of 13 goal and 5 assist campaign last time around. At 23 he’s the kind of age we need to be looking at when it comes to new arrivals, particularly in the attacking third of the field where we have a clutch of players around the 29/30 mark and who will need to be replaced in the not too distant future. How much truth there is in our interest remains to be seen, and whether we can get him is another question. If we do want him though, it’ll be a good test for our new executive team and perhaps for KSE who we know can talk the talk but will they walk the walk – and by walk the walk I mean give us a few quid to make the transfer happen? We shall see. For some extra reading this morning, this is really interesting stuff from Tim Stillman who spoke to Arsenal Women attacker Danielle van de Donk and she outlines a week in her life at the club in terms of training, diet, matches and more. The timing is good as well, because this morning we’re launching a brand new series called ‘Pastcast Extra’, in which James and I podcast about a game as if it’s just happened. We got a couple in the can last night, and the first one will be available very soon. The match in question is Arsenal 5-3 Boro on August 22nd 2004, the day the Premier League gave us a gold trophy and we equalled Nottingham Forest’s 42 game unbeaten run in what was an extraordinary afternoon at Highbury. That’s coming up, and I’ll be back tomorrow with more blogging here, and a regular old Arsecast, the shaggy dog of the Arsenal podcast world. Previous articleCan further boardroom changes help Arsenal compete?